So then, remember that at one time you Gentiles by birth, called ‘the uncircumcision’ by those who are called ‘the circumcision’—a physical circumcision made in the flesh by human hands— remember that you were at that time without Christ, being aliens from the commonwealth of Israel, and strangers to the covenants of promise, having no hope and without God in the world. But now in Christ Jesus you who once were far off have been brought near by the blood of Christ. For he is our peace; in his flesh he has made both groups into one and has broken down the dividing wall, that is, the hostility between us. He has abolished the law with its commandments and ordinances, so that he might create in himself one new humanity in place of the two, thus making peace, and might reconcile both groups to God in one body through the cross, thus putting to death that hostility through it. So he came and proclaimed peace to you who were far off and peace to those who were near; for through him both of us have access in one Spirit to the Father. So then you are no longer strangers and aliens, but you are citizens with the saints and also members of the household of God, built upon the foundation of the apostles and prophets, with Christ Jesus himself as the keystone. In him the whole structure is joined together and grows into a holy temple in the Lord; in whom you also are built together spiritually into a dwelling-place for God. Since the last time we gathered in this sanctuary together, four buildings of black churches in three states have been intentionally set on fire, the KKK held a rally at the South Carolina capitol building, and funerals were held for four of the nine people killed at Mother Emanuel church in Charleston. In the 20 years since David LaMotte wrote that song, it seems not much has changed. And yet this week the Supreme Court showed us just how much has changed at the same time. It’s been a week of ups and downs, one moment seeing the dividing wall of hostility crumbling before our eyes, the next seeing it built back up brick by brick. One minute, we seem so close to touching the kingdom of God, and the next minute any glimpse of grace seems impossibly far away. The Ephesians were a divided people too. Their division was based on the accident of birth, and to be called “the uncircumcision” was a derogatory slur used to keep Gentiles in their place. Those who used it said with just one word that a person was outside the realm of God, an alien among the people of Israel, completely without hope and alone in the world. Our human talent for separating ourselves from those who are different has deep roots. But now, this letter says: but now—right this minute, not later, not someday in heaven, now—you have been brought near in Christ. Now, Christ has made one body, one family, one commonwealth, one household, by breaking down all our walls and legalese and categories. In his own broken and glorified body, he has broken our fractured humanity into one. And still churches burn, and children die, and families are separated at the most crucial moments of their lives. And the dividing wall seems to fly high and run deep in so many places. And we try to brush off history and shut out voices that disagree and then watch in horror as it happens again and again. It seems naïve at best to stand here and say “Christ is our peace” and “you are no longer strangers or aliens or outcasts, all of us are part of the household of God.” They are beautiful words, and they are true words, and even the truest words are meaningless when our action and our inaction perpetuate sin rather than renewed relationship. And yet I’ve got a lot of hope for the future, and dreams for a better world. Hopes and dreams are not the same as optimism or fantasy—our hope is rooted in God’s promise, and our dreams are the same ones God has been giving people since Genesis. Hope implies trust. Do we trust God’s promise enough to have hope? Enough to work to make it a reality, not just a nice but meaningless word? We have seen the work of hope triumph, and we have seen it fall under rubble…all in one week. No one ever tells you that it’s hard work to be in a family. The household of God is just as complex as any of ours, with personality clashes, inside jokes, old photo albums, and deeply ingrained prejudice right alongside laughter and tears and board games and the dress-up box. We have awkward holiday dinners, joyous reunions, frustrating conversations, unimaginable support, and so much love we wouldn’t have it any other way. And like any other family, we don’t choose who is in the household of God. We don’t get to choose which branch of the family we’ll be born into, or who marries who, or where babies are born. The Lord builds the house, drawing humanity together into one family, one body, one household—a dwelling place for the spirit. Not just a gathering of individuals, not just a collection of special interest groups—a dwelling place for the Spirit. I love the image the writer of Ephesians uses here. He says that the house of God is built on the foundation of the apostles and prophets—those who spoke the word, even when no one was listening. And the whole structure holds together because Christ is the keystone. When that one stone at the top of an arch is taken out, the arch falls. But here’s the thing: it is hard work to remove a keystone. Once it is in its place at the peak, it’s really only mother nature that can get it out. But God is our solid rock, and the living Word of God can never be swept away by erosion. And though the earth should shake and mountains crumble, the living Word of God stands forever, holding the whole household of God together from the pinnacle. And we, the living stones built together for God’s glory, look around and find ourselves wedged in together with people we never expected to see—people of every color and nation, every language, every immigration status, every sexual orientation, every age, every part of God’s great and glorious family throughout all time and space. Sometimes we get a glimpse of the glorious diversity of God’s household, and we rejoice to see God’s promise of love. Sometimes we shut the door and hope the Spirit won’t notice. Sometimes we pretend that the door is wide open…as long as you look and act and love right. Sometimes we try to remodel according to our own specifications, and sometimes we follow the plans of the master builder. Sometimes we do all those things in one week. But no matter how many dividing walls we put up, the cross shatters everything we thought we knew and bridges the gap between people, drawing us all into Christ’s body. So what would happen if we put out our empty hand, rather than adding planks to a crumbling security fence? To put out an empty hand is to be vulnerable—which is to say, on equal footing rather than in a position of giving to the underprivileged. To put out an empty hand is to make the first move to cross the divide, rather than wait for them to come to us. To put out an empty hand is to look into the eyes of another child of God, bringing the only thing we have to offer: gratitude. To put out an empty hand is to be ready to receive tools to use for the building of the kingdom, rather than clinging to the weapons used for the building of empire. Or we could stand and shake our heads and look away, whether from fear or indifference or disgust or hate or helplessness or privilege…and when we look up we will find Christ, bruised and weeping, hungry and angry, pleading and reaching out to us. For as often as we have done it to the least of these who are members of his family, we have done it to him. Or, if we take seriously that we are the body of Christ, then we have done it to ourselves—for when one member suffers, all suffer together with it, and when one member rejoices, all rejoice together with it. Christ is our peace—he has broken open his own flesh to make one humanity in place of the dozens we have created, he has broken down the door of the grave to bring the kingdom of heaven to all creation, he has broken down the dividing wall of our prejudice and privilege and built us into one house, one body, with one Spirit and of one mind with him. And he calls us to be a part of this work—dismantling the dividing walls one flag at a time, one stereotype, one joke, one gut reaction, one silence, one historical lie, one unloving thought at a time. This week, the challenge for us is to go out from our comfortable place and reach out a hand across a wall—whether it’s a wall of class or race, gender or orientation, religion or language. Make the first move to participate in Christ’s work of breaking down walls, and see what happens when we view every single person as a member of our household, rather than someone else’s. I’ve got a lot of hope for the future, and a lot of dreams…and a lot of work to do. May we all reach out a hand and do the work. This past Tuesday, I woke up and went strawberry picking, and thought about wisdom and foolishness and beauty. And Thursday morning I woke up to terror in the news. Nine bodies, each a reflection of God’s glory. Nine faces, each the image of God. Nine stories, immersed in God’s story. And one young man, also made in the image of God, a child of a mainline protestant church, also hearing God’s story, but his head filled instead with lies our culture has been telling for centuries—lies about what he deserves, lies about “them,” lies about crime. I want to say this is unimaginable, that I can’t understand. But the thing is, I’m not sure it is so unimaginable. We have become used to this kind of violence—it is a tragedy now and in a couple of days we will have the privilege of forgetting about it until the next time it happens. We don’t want to talk about underlying issues, don’t want to name it for what it is, instead insisting that it was one guy, one mental illness, one person who never grasped the message that God is love, and that love is for all people. Over and over, several times a year, we make those same claims. Charleston is the next chapter in our repeat of our history, the logical next step in a past that we seem doomed to re-live because we refuse to look honestly at it and then decide to be different. Which was, sadly, the exact situation in Corinth when Paul was writing to the church there. Corinth was a Roman colony, and was populated by two classes of people—the newly wealthy, and the poor. The city was known to have lots of money but no class, heavy on ostentation and low on cultural depth. The city and its people lacked charm and grace, and they tried to make up for it with show and power. It was the Corinthian Dream, really, to move there and work up the ladder to get into that elite upper class. Unfortunately, the way they did that was by openly stepping all over the poor. The Corinthians had no qualms about pushing other people down so they could climb up, no difficulty with ignoring the needs of their neighbors because they didn’t have the status or power to matter. It was a classic rich-get-richer-and-poor-get-poorer kind of situation. Some people were kept down, others were buoyed up, and there was very little social mobility…though that didn’t stop the dream. We always hope the church will be different—it will be the place where divisions fall away and all that matters is that we are together worshipping God. But then as now, the church was not terribly different from the world. The rich came early and feasted before the poor could arrive for worship. The church was divided, with some following one preacher and some another. The people still seemed to seek the kind of philosophy that would help them reach their own goals, which had primarily to do with prosperity and security. And this is not the first time they’ve corresponded with Paul. Though we call this letter 1st Corinthians, Paul references at least one prior exchange of letters. So the discussion is ongoing, and Paul is beginning to get exasperated. As if calling out their celebrity preacher crushes was not enough for the introduction of a letter, Paul turns immediately to the point: the Corinthians look for wisdom that will confirm what they think they know, that will support them in their division and their warped understanding of themselves and the world. They look for a philosophy that will make them look good, even if it has no depth…and bonus if it helps them socially or economically. But we proclaim Christ, crucified and risen, the wisdom of God. And the idea that God’s wisdom could involve a cross is stupid, at best. That God’s wisdom would also involve peasants, subverting the economic and political system, and nonviolence is beyond the comprehension of philosophy or common sense. But God chose what is foolish in the world to shame the wise. God chose what is weak in the world to shame the strong. God chose what is low and despised to bring to nothing the things that are revered. Those are hard words for those of us who unwittingly occupy the cultural space of strength, wisdom, and power. Of course, it is too late for Cynthia, and Clementa, and Sharonda, and Daniel, and Depayne, and Tywanza, and Myra, and Ethel, and Susie. It is too late for Dylann. It is too late for countless other people who have been sacrificed to our wisdom. They rest from their labors, and their works follow them. Paul writes to remind the Corinthians, and us, that there is just the one way to life—and that way involves almost none of the things they pride themselves on. That way does not step on people. That way does not trample God’s creation. That way does not allow for some to be in and some to be left out—in just a few chapters he will tie us together as one body, insisting that those who seem to be weaker are to be more greatly honored. That way is not wide enough to accommodate all the things we want to bring with us, including our unexamined privilege. The way is wide enough for exactly one thing: a cross. The symbol of all that is despised and shameful, the instrument of torture, the method of erasing people. The cross, which so briefly held the body of our Lord but now stands empty to the sky, connecting the world God so loved to the kingdom of heaven. It’s Foolishness, of course—let go of the assumptions that allow me to be comfortable in the world? let go of the behaviors that make me feel good about myself? let go of the things I love about my life and personality? Why would I do that? Foolishness—love my neighbor? what can they do for me? love my enemy? that will just get me killed. lay aside weapons and resist with cunning and peace? sounds like a recipe for disaster. love God more than anything? does that include my security? my home? my great hair? Who is my neighbor? What does love mean anyway? Foolishness—be in the same mind and the same purpose? But I was promised freedom. I was told I was responsible for myself, and only myself. I was told I could do whatever I wanted when I grow up. I was told that our founders intended for me to pursue my own happiness, not to be bogged down with other people, especially people who impede my happiness and constrain my freedom. And the message of the cross is foolishness to those who are perishing. We who are continually shoring up this world’s system, we have no free hands with which to take up the cross, and we have too much stuff with us to walk through the narrow gate. To those who are being saved, though—being saved, in the process of living into God’s call and promise—to we who are being saved, the cross is the wisdom and power of God. To we who are earnestly seeking God’s path, the cross offers a map and invitation—lay down your burden and come, follow. Lay down the burden of blinders that keep us from owning our history and moving forward in a new direction. Lay down the burden of self righteousness that shadows our good intentions. Lay down the burden of helplessness that paralyzes our faith. Then pick up the cross—knowing that it might hurt, and that it is the only way. This is a hard prayer—“my kingdoms go.” The wisdom of the world is something we can understand, hold on to, and point to when we want to insist that none of this is our problem and we had nothing to do with it. Regardless of what I think about it, the system of this culture works for me, as a white middle class woman with a world class education and a strong loving family. So why do we allow it? Do we truly believe we can’t change anything? Do we secretly believe everyone is on their own in the world and it isn’t our job or problem? Or do we not want to, because it might be uncomfortable or even dangerous? Are we worried about what happens when we lay down false wisdom and embrace God’s foolishness? I am worried about what happens when we don’t. The members and pastors of Mother Emanuel church have paid the price already, alongside the four girls in their Sunday School class in 1963 and countless others over the years. 52 years ago, at the funeral for the girls killed by the bombing of their church, Martin Luther King Junior begged us all, of every skin color, to substitute courage for caution, and to be passionate in unmasking not only the murderer but the system, way of life, and philosophy that allowed him to be created in our midst. He pointed out that when we of the majority are silent, it is the same as consent and approval for these horrific acts and mindsets. How long will we believe that somehow they and we are not part of the same body of Christ? How long will we, subconsciously or blatantly, insist that we are different, separate, not responsible? How long will we renounce sin and evil with our words, while we continue to unconsciously benefit from the racist systems built by those who have gone before us? Or worse, to pretend we have no part in this sin of racism? For if we say we have no sin, we deceive only ourselves and there is no room for truth in us. Friends, when even the church that has been the symbol of freedom for a people, a sanctuary, is a place of terror, then it is well past time for us to take up the cross that our sisters and brothers of color have been carrying for so long. Otherwise we run the risk of being salt that has lost its saltiness, and leaving the world to the kind of wisdom that reigned in Corinth and still reigns today. And we are the body of Christ, and we have seen the still more excellent way—the question is whether we will walk it into abundant life for all, or choose the easier path that leads only to destruction. So this week, pay attention to how this kingdom benefits you, and then pray “my kingdom go.” Find a way to stand up for justice, for equality, against racism and sexism, for nonviolence, for hope. Pray “my kingdom go, your kingdom come” over and over, and allow God to use your life as a candle that lights the darkness, a conduit for the Spirit to move the whole world, one step at a time. We use the word "our" to describe people all the time. They're our people--people with whom we share ideals. They're our kids--kids who live nearby, go to neighborhood schools, sit in the same pews we do. They're our troops--who put their lives on the line to "protect our freedom." But for some reason we neglect to use the word our when we talk about children killed by police at the playground. We don't say that Trayvon or Tamir or Michael are our kids. We also neglect to use it when we talk about people who commit acts of violence. 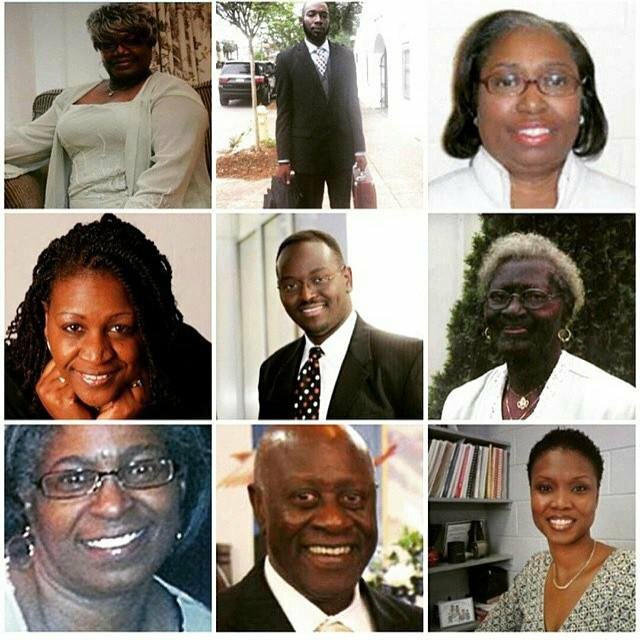 Dylann Roof isn't one of ours. If one member of the Body suffers, all suffer together with it. How is it, again, that we, of all people, THE CHURCH, are capable of using the word "they"?? And if we want to leave aside the faith part and just think on a civitas/polis scale: how can we deny that Rev. Pinckney, Coach Coleman, Librarian Hurd, Sexton Ethel, new college graduate Sanders, Mrs. Thompson, Rev. Dr. Simmons, Freddie, Pearlie, May, Eric, Aura, Renisha, Lavall, Antonio, Nicholas, Oscar, Sean, Kevin, Akai, Walter, Jordan, Rekia, Aiyana, and countless more, are ours? How can we deny that Timothy, Dylann, and all the terrorists in between are ours? They are us. And just as they are ours, we are theirs. That's what it means to be part of one nation under God, or the Body of Christ. When it's our kids, our people, our troops, we care, and we see some level of responsibility, and we mobilize when things happen--good or bad. What would happen if we thought of each one of those people at last night's Bible Study at Emanuel AME Church as "ours"? What would happen if we thought of Mike Brown as "ours"? What would happen if we thought of Tamir Rice as "ours"? What would happen if we thought of Eric Garner as "ours"? And what would happen if we thought of Dylann Roof as "ours"? What would happen if we thought of the police officers of the McKinney TX police department as "ours"? What would happen if we thought of Adam Lanza as "ours"? Because here's the thing: they are ours. These beloved children of God, made in God's image, simultaneously sinner and justified, are our kids, our neighbors, our troops, our brothers and sisters, our responsibility. Which means that when one suffers, we all suffer. When one dies, we all die. When one hurts, we all hurt. When one does harm, we all bear some of that guilt and pain. When one celebrates, we all celebrate. After all, we celebrate when one of our kids graduates. We grieve when one of our neighbors dies. We groan alongside our friends who are ill. We would be outraged if one of our Bible Studies were the scene of terrorism. And we would wonder what happened and how we could have done something differently if the shooter were one of ours. Time to celebrate, and grieve, and groan, and be outraged, and think about how we could have done something differently. We are just as much a part of creating and maintaining this culture as anyone else. How about we make it better for everyone, not just the people who look/think/act/speak like us? There are many members but one body. The eye cannot say to the hand, "I have no need of you," nor again the head to the feet, "I have no need of you." On the contrary, the members of the body that seem to be weaker are indispensable. Now y'all are the Body of Christ, and individually members of it. It's time to start acting like it.